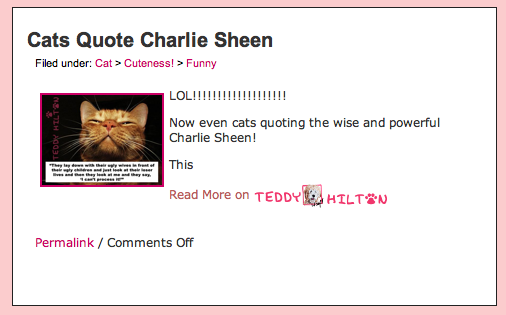 Oh, Perez Hilton. You make it so easy. Craig points out that Charlie is obviously mentally ill and to poke fun at him is just exasperating the situation. And he has a point…one we fully agreed with. Truthfully, we know it seems easy to have a laugh at a man who calls himself an adonis with tiger's blood coursing through his veins, but if you're really paying attention, there really isn't anything funny about what Charlie is doing to himself and to the people in his life. Craig Ferguson is right. As for Perez, he is, as usual, a jackass. Ten posts below the Ferguson bit is the post you see above, which reads, "Cats Quote Charlie Sheen: LOL!!!!!!!!!!!!!!!!!!!!!!!!!!!" And then a page or so after the Ferguson post, there's another gem titled "What if Sheen Was Darth Vader?" which Perez calls "so, so funny."